Chances are good your dog will suffer an injury to one of his paws in his lifetime. After all, he walks all over them. Our goal is to prevent dog paw problems when possible, detect potential problems early, and know when we can treat at home or when it’s necessary to beat feet (excuse the pun) to the vet. I’ve traveled to more than 80 countries, most recently a six-week trip to South America. While at Machu Picchu and in the Galapagos Islands, I was amazed to see locals walking barefoot along thorny paths, on sharp rocks and through burning hot sand. I’m a tender foot and worry about stepping on a single pebble or hot sand. But what about pets? Contrary to what some might think, a dog paw isn’t constructed of the same thing bulletproof vests are made of. Despite this, many of us seem to think nothing of our dogs walking over paths filled with stickers and burrs, across sun-baked pavement, or across jagged sheets of ice. While Mother Nature designed dog paws to “take a licking and keep on ticking,” they can still get cuts, scrapes, burns and frostbite. Do a weekly dog paw check to ensure your dog’s paws stay healthy. Photography by Tierney MJ / Shutterstock. When a dog starts to limp, most people will take a good look at the feet to see what’s wrong. But get in the habit of looking at each foot weekly. Get down on the floor, or do it with your dog in your lap. Look at the top and the bottom of the foot, between the toes, the foot pads, between the foot pads and check the nails. Look for redness, swelling, tenderness, bleeding or signs of irritation. Press gently on the pads, around the toes, and on the nail bed. If your dog winces, whimpers, or pulls away like it’s causing discomfort, look closer. The three things I’d be most suspicious of are foreign bodies (slivers, weed seeds, gum), cuts, or signs that the dog has been licking her paws (wet and red underneath the feet or brown on top from saliva staining. If your pets are ever in the weeds, it’s easy for a dog paw to pick up burrs or awns (think cheatgrass or foxtails) between their toes. Those plant invaders can quickly burrow their way inside the foot and literally end up all over the body. I recommend daily dog paw checks if your dog is around these heinous hitchhikers. If it’s a burr, you may need to trim a little hair or apply mineral oil to get it out. For awns, I use a pair of needle nose pliers. It’s common for long-haired dogs to develop mats between the dog paw foot pads, which can chafe and cause irritation. In the summer, we trim the hair between all of our dogs’ feet to prevent this and make it easier to see foreign bodies like grass awns. A dog paw may become irritated from too much moisture. After your dog comes in from a swim or a romp in the wet grass, dry his feet off with a towel. Sometimes the excess moisture comes from incessant licking if he has a bacterial or fungal infection that itches (think of how athlete’s foot drives us crazy!). I’m a big fan of weekly baths for pets, and I encourage you to put a couple of inches of water in the bottom of the sink or tub, and add some Epsom salt in the water. On the other hand, dog paw dryness is an issue, too. For years I’ve recommended Musher’s Secret, a wax that moisturizes, lubricates (to prevent snow or ice balls from forming), and forms a breathable bond with paws. It doesn’t take long to soak in; I put it on about once a month year-round. But don’t use it too often: If pads are too soft, they’ll be more prone to injury. 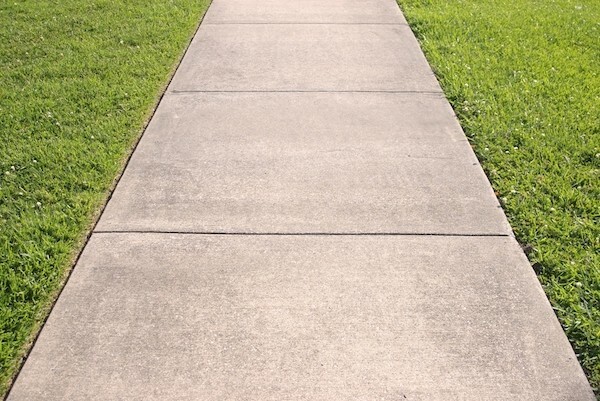 Concrete sidewalk. Photography by 3445128471 / Shutterstock. I can’t tell you how many cases of burned dog paws I’ve seen from pet owners who walked their dog on hot asphalt or concrete. My rule of thumb: If the surface is too hot for the palm of your hand, it’s too hot for a dog paw! In the winter, salt or other deicers can really wreak havoc on your canine’s four-wheel drive, as they irritate and dry the feet. After our dogs have been out for a walk where they might have tromped across and in these offending substances, we simply dip their feet in a large plastic drinking glass and towel dry. Imagine all the icky-sticky stuff that’s on the ground and gets walked on. Chewing gum, tree sap, motor oil, antifreeze, tar — the list goes on. To clean these off of a dog paw, use a little Dawn dishwasher detergent; others recommend olive oil. If the gunk won’t loosen, you may have to trim it out or head to the vet to handle. Trust me, you don’t want to accidentally cut the foot pad with scissors or a pair of trimmers. When cut, the same blood supply that warms pet’s feet in the winter and cools them in the summer spurts like a Texas oil well. This might seem like a lot of work, but I promise: An ounce of paw-vention is worth a pound of cure! Thumbnail: Photography by Nataliya Dorokhina / Shutterstock. Dr. Marty Becker, “America’s Veterinarian,” has spent his life working toward better health for pets and the people who love them. The author of 24 books, Dr. Becker was the resident veterinary contributor on Good Morning America for 17 years. He is currently a member of the board of directors of the American Humane Association as well as its chief veterinary correspondent, a founding member of Core Team Oz for The Dr. Oz Show, and a member of the Dr. Oz Advisory Board. When his schedule allows, he practices at North Idaho Animal Hospital. Connect with him on Facebook and on Twitter.